Australia took an early lead at the full marathon event for the World Masters Athletics Championships held in Perth. Image – Vincent Patrick. The World Masters Athletics Championships yesterday came to a close in Perth (WA) with the final events of the half marathon and full marathon being played out along the foreshore of the Swan River. With thanks to the West Australian Marathon Club facilities in Burswood, marathon participants started their race 15 minutes late (at 6:15am) due to a computer glitch at registration, but the half marathon runners started right on time at 6:30am and it was smooth sailing from there. The course was the same as the Perth Half and Perth Marathon, from Burswood through to the University of WA and back again (two laps for the 42.2kms event). But despite the flat paths along the riverside, the weather played a deceitful game with a strong south-westerly head wind hitting runners as soon as they crossed the Narrows Bridge. For those not keeping track of weather conditions, frontrunners had to strategically take note of their pace once faced with the sea breeze, while those who knew of the impending winds kept their gait steady from the get-go, knowing all too well what it was like to run from the Narrows towards the university. But from that 10.5kms turnaround point, the breeze disappeared and it was all heat as temperatures soared to 26 degrees and the sun hit hard without much cloud cover. From the start, Australia took an early lead for the men and held it there, both Todd Ingraham and Wayne Spies holding strong ahead much of the way together with Poland’s Grzegorz Gronostaj and Spain’s Juan Vazquez Sanchez. Christene Oosthuizen from Australia took control of the women’s marathon the entire way and stayed ahead with an approximate 15 minute lead in front of Italy’s Denise Tappatà and Aussie Margaret Hadley, who proudly claimed the bronze and pushed her way through the gruelling conditions. All three women competed in the youngest age category of W35-39. One of the oldest competitors in the half marathon, Australian Alwyn Barnesby, finished well ahead of some of the younger runners, in 2:47:59. Image – Vincent Patrick. But it wasn’t just the frontrunners who took the course by storm with their athleticism; it was the determination and sportsmanship of the older entrants who captured the hearts of volunteers, fellow competitors and sideliners. In the full marathon the two oldest competitors both hailed from Japan – Michio Kumamoto in the M85-89 category and Satsuko Suzuki in the W75-79. Incredibly Kumamoto finished 42.2kms in 4:48:18 while Suzuki crossed the line in 5:47:44. The half marathon also had lay claim to some older competitors including France’s Christian Larcher (M85-89) who beat many of the younger runners with his time of 2:28:44 and Aussie Alwyn Barnesby (M80-84) not too far behind. Germany’s Erika Krueger and Australia’s Pamela Mews also successfully ran their 21.1kms in 2:54:10 and 4:32:01 respectively (W80-84). The World Masters had a wheelchair competitor take on the marathon event, a (non-confirmed) first, and it was much-loved Aussie Chris ‘Wheelsie’ Keillor who took determination to an entirely new level and finished in 3:59:07 – all in a hospital standard grade wheelchair and with a smile on his face the whole way through. Some dramas did occur however due to heat exposure, with reports from one source that both a German and New Zealand runner collapsed on course and required ambulance assistance. But in true Aussie spirit, it was Australian marathon competitor Ian Nichol who gave up his race to take a DNF in order to assist the two. 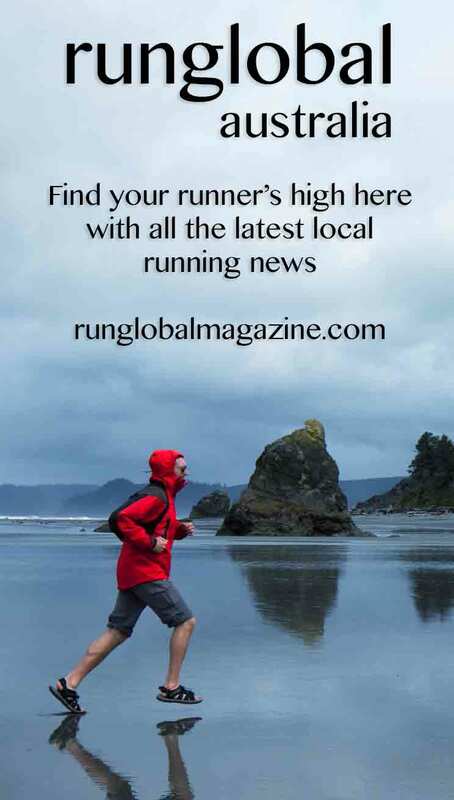 Runglobal gives virtual high fives to all runners and the amazing volunteers who gave up their Sunday morning to help at aid stations, marshall on the roads and assist at the start and finish lines. Special thanks to all those who took the time to take photographs so runners could capture their moments in history. Wheelchair competitor in the marathon event, Chris ‘Wheelsie’ Keillor, had a smile on his face the entire way. Image – Andrew Yeatman.